This is our 55 gallon tank. This is where all our goldfish live. 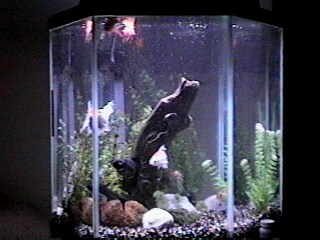 There are eight goldfish and an iridescent shark. We recently moved the goldfish frome the 40 gallon hexagonal tank into the 55 gallon tank. All the goldfish pictures on these pages were taken when the goldfish were in the 40 gallon. They are much happier now with all the extra room! This is our 20 gallon tank. It's been set up since Dec 97. Many of the pictures on this sight, besides the goldfish, are from this tank. It has an Aquaclear Mini, and a Powerhead 201 running an undergravel for filtration. It also has a Second Nature Challenger 75W heater. This is a community tank. 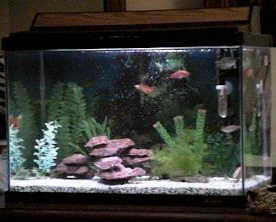 It contains Mollies (Sailfin, Marble and Swordtail), a Rainbow Dannio, and two Cherry Barbs. This is our 40 gallon hexagonal tank. This tank is running an Aquaclear 300 and a Powerhead 201 on the undergravel for filtration and a 200W heater. This used to be our goldfish tank but we moved the goldfish to our 55 gallon and the 40 gallon is now a community tank. In the 40 gallon there are Gouramies (Three spot, Opaline, Sunset, Neon Blue, and Giant), Barbs (Tiger, Strawberry, Rosey, Long Fin) a Betta, and a Fiddler Crab.